Toy Box lucky emblems are collectibles in Kingdom Hearts 3. They’re hidden Mickey heads you can find in the world from Toy Story. There’s eleven of them, hidden across two areas – Andy’s house and a toy store called Galaxy Toys. Some of them are in obvious places, while others are really well hidden, or require you to look at them from a specific angle. This guide is going to show you all Kingdom Hearts 3 Lucky Emblem Toy Box locations. You’ll find the first hidden Mickey on the bookshelf to the left of the door in Andy’s room. Climb onto the top shelf and look at the blue box next to the bucket of soldiers. For the second one, you’ll have to jump out the window next to the bed. You’ll land onto the garage roof. Look for the lucky mark in the far right corner of the roof. The third lucky emblem is at the front door. Climb onto the desk and jump out the window. 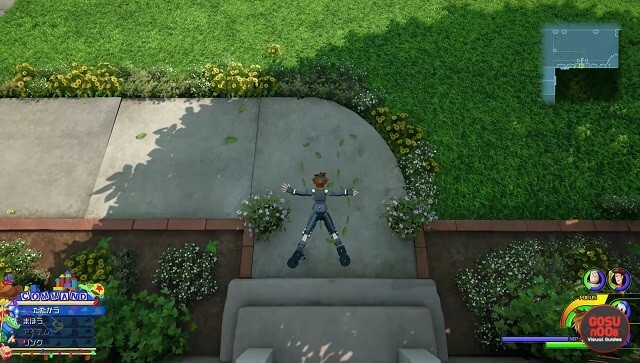 Go in front of the door and look at the concrete path – you’ll see Mickey’s head made of leaves. The fourth one is also outside. You’ll find it on the back side of the mini van across the street. Once you’re at the store, you’ll find the first emblem behind the checkout counter to the right of the entrance. Get up next to the first cash register and you’ll see a wrapping station. The Mickey head will be made of tape rolls. In order to get the next one, you’ll have to use the robot in front of the Gigas store, to the left of the entrance. Use it to destroy the pile of toys on the other side of the store, the one with the big robot statue at the top. Once the boxes disappear, you’ll find the emblem at the base of the pile. For the next one, you’ll need to spawn on the second floor (the red one). Go into the Action store and head left, all the way to the Beasts & Bugs section (the one with the giant robot above the shelves). Climb into the vent left of the robot and follow the duct until you reach the first vertical area. Go into the lower of the two tunnels and turn around – you’ll see the Mickey head on the wall. The next one is on the third floor (the blue one). Go right from the spawn point until you get to the benches in front of the pink store. Jump over the edge of the balcony and onto the spaceship. The emblem will be on the hatch. While you’re on the third floor, go into the pink doll store. Look for a display to the left of the checkout counter. Climb it and look towards the counter – the emblem will be made up of the three disco balls hanging from the ceiling. The tenth collectible is easy – just spawn on the third floor and head towards the robot statue on the left. You’ll find a Mickey head on the plinth. The last lucky emblem is actually not in the store itself – it’s outside. Spawn at the entrance (ground floor) and turn around. Head outside and immediately look to your right. You’ll see a pile of boxes by the wall, and a Mickey head made up of stickers and logos. There is one more which is the disco balls in the toddler store, get on top of the julia showcase and look at the disco balls for right angle for the emblem.